Did I make a Pretty Crafty Home? Yes, I think for the most part, I did. Goodness me, i's hard to believe we are now coming to the end of the year in which I decided to make a pledge to make my home a nicer, happier and craftier home to live in. The Pretty Crafty Home, or PCH project has been a great motivator for me and I hope it has been for those of you that joined in too. I thought I'd have a little look back at what I've done this year and share some of my favourite bits with you. Has to be this great project that me and The Little One worked on in the school holidays. Easy enough for both of us and as simple or creative as we wanted to be. It was great. Making over these box files was a walk in the park. A lick of paint, a little decoupage and a splash of Mod Podge. Done in a day. Without a doubt it was the decision to wallpaper over the dreaded red wall in the dinning room. 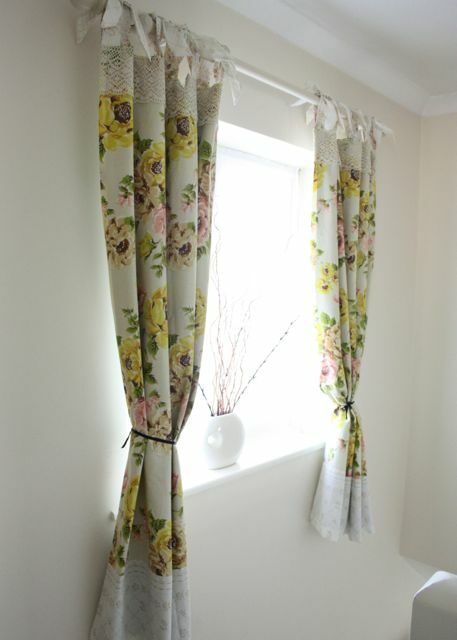 I updated the curtains and made new curtain ties too, so there was plenty to get on with. Absolutely worth it though. These chair covers were the hardest and consequentially the thing I'm most proud of. In fact I really still can't quite believe that I managed it even now! My favourite make of the whole year has to been these thrifty curtains that I made from some salvaged bedsheets and cut up old duvets. It's the perfect type of PCH project, thrifty, recycled, repurposed and home made through and through. What about you? What's your favourite project been? If you'd like to leave a link in the comments, I'm sure we'd all love to come and check it out. For me, this year has shown me that if I put my mind to it, I can make things happen and make a difference around here so I'm not stopping just yet. There's still things on the list waiting to be done after all. I hope you've enjoyed coming with me on this pretty crafty journey and that you'll keep up the good work next year and in the years to come too. Wow! What a fab year's worth of projects. Very inspiring. Yes, you did indeed make a very lovely crafty home!I just love your crafting room! I remember when you were working on that and you've done a marvellous and very pretty job! Oh, everything looks so nice! You did a great job! You really did accomplish a lot! Everything looks great! Hi, Sandra! 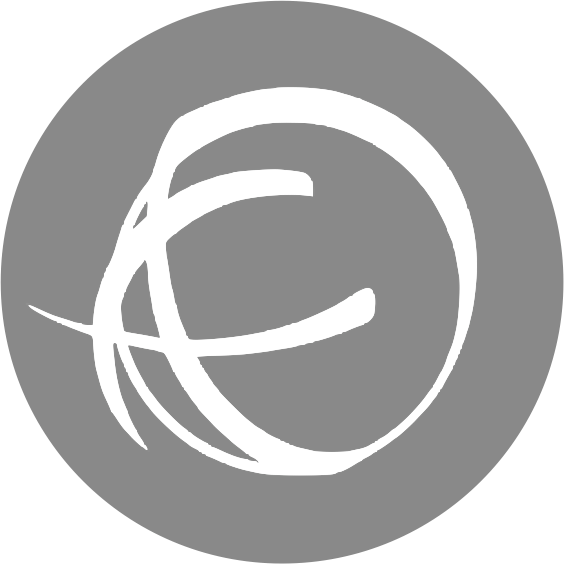 For me the most fun this year was the creation of the blog. Hard work if you do not know much computer (this happens to me) but at the time it was the discovery of a new world. The most wonderful thing was meeting people like you, one of the great artists, crafts, crocheting, sewing ... I've learned so much in a few months ... and I still have much to learn ... I see beautiful things every day online and thanks to people like you I grew as a person, I've learned some new techniques and above all, have with you a great source of inspiration. Million thanks for everything, Sandra! 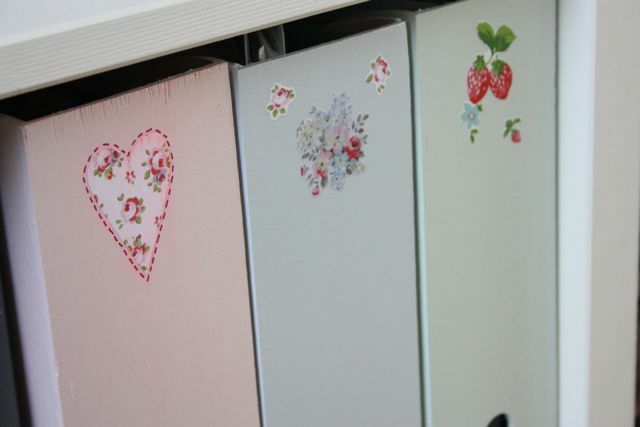 By the way, I love the craft of painting and decorating needles hanging clothes. Congratulations for your blog! And, once again, THANK YOU! How wonderful your home looks, quite an inspiration! I love the thrifty curtains too, well done. I'm looking forward to your 2013 makes! You did inspire all of us..... I came in a little late - but I was able to at least start working on my pretty crafty home.... your projects are so much fun and I am glad to have found you this past year! Well done - you certainly achieved a lot of home loving during this year!! It's been lovely to share your makes on your blog. I have been improving my home (in a thrifty, upcycling way this year) and my favourite makeover has certainly been my table and chairs. Well done for achieving so much. The chair cover definitely looks the trickiest. Hope you can continue with more goodies next year. It was a great pledge to be a part of! Although, I feel I should have done more... but I guess there is always going to be more to do! 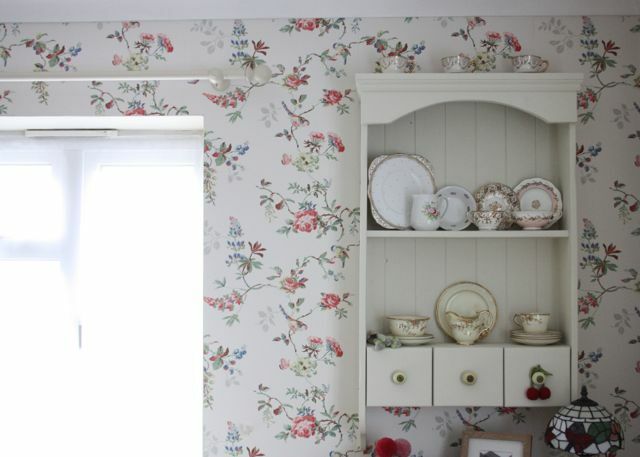 Wow, those curtains and the chair cover are beautiful - and that wallpaper is wonderful. 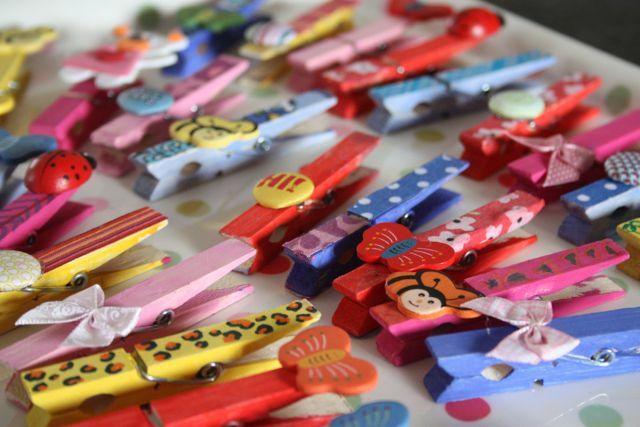 Love those cheerful clothespins too! You've certainly done some lovely things. For me this year ended up being more about decluttering and rethinking how everything is stored. Next year I'll work on the pretty part! Bravo! C'est vraiment très reusii! Hello Sandra, I think you have done a great job and I think it is a marvellous idea to set yourself goals to get aim for with crafting. I find it is very easy to get side-tracked and lots of ideas take shape but not a lot actually gets made. Well done for completing all these lovely project. My favourite is your patchwork chair. I love it!! I think answer is yes! What a PCH! 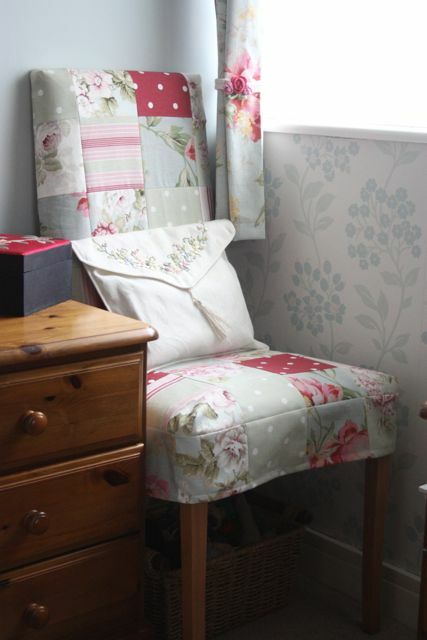 I love the patchwork chair cover. The thing i'm most proud of this year are the knitted bridesmaid shrugs I was comissioned to make by a friend. They were my first ever paid for comission and the bride was thrilled with the result. Did you make a pretty crafty home? Absolutely!! 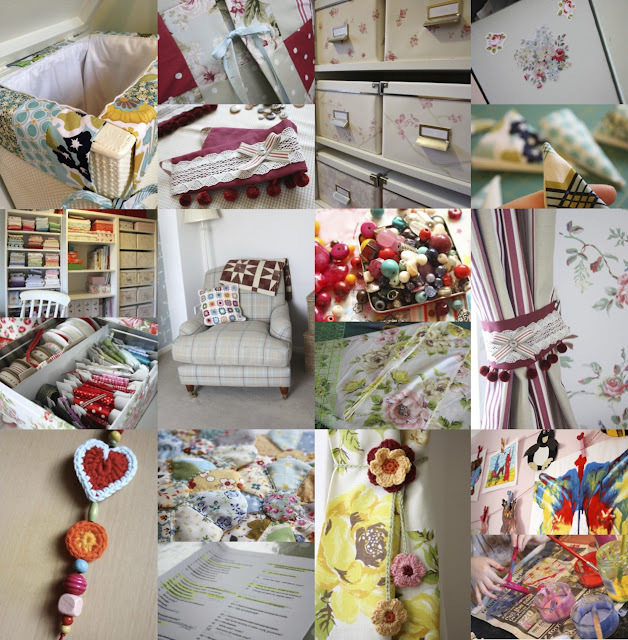 Thank you SO MUCH for inspiring us all this year to make a Pretty Crafty Home. You really mae some wonderful improvements. My progress was not as I had wished for, but I am happy with what I could accomplish. And I am still encouraged to keep going the next year. Thanks again for the inspiration!!! Oh you've done so well Sandra your home is looking gorgeous! My favourite makeover this year? Oh I'm not sure but I think the chest of drawers I bought at the tip has to be the best!